Anthony Crolla shocked his mother in November by deciding not to ask Vasyl Lomachenko for a photograph when he had the chance. Puzzled, she asked why - and was told by her son: "Because I want to fight him, mum." It was not known then that the Manchester fighter would get his chance, but he still refused, in his own words, to "be a fan boy". As things have turned out, he will face the unified world lightweight champion at Los Angeles' Staples Center on Friday. "I want to be in there against the best, carry out the plan and shock the world," Crolla told BBC Radio 5 Live's boxing podcast. With Lomachenko priced as a prohibitive 1-66 favourite with some bookmakers, a Crolla victory would indeed be a huge shock. The 31-year-old Ukrainian's CV boasts two Olympic gold medals and in 13 professional fights, he has mopped up world titles at record pace in three different weight divisions. After an amateur career which brought a reported 396 wins and just one loss, his professional ascent was swift and eye-catching. 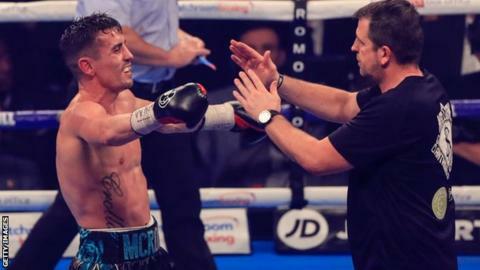 Crolla has faced criticism for even taking the fight after the WBA and WBO world lightweight champion's original opponent - IBF champion Richard Commey - withdrew because of injury. "I don't see it as if I'm somehow lucky to be sharing the ring with him," Crolla, 32, added. "Yes, I admire him greatly but my plan is to shock the world. I have earned this shot. "When I said no, she asked: Why not? And I said: Because I want to fight him, mum. "I thought: 'I am not being a fan boy when I want to fight you for the best prizes in the sport.' For me, this is a job." Crolla spoke to BBC Radio 5 Live moments after a recovery session in a cryotherapy chamber set at minus 136 degrees. The former WBA world lightweight champion "double dipped" in going through two three-minute blasts of the therapy, while 5 Live boxing analyst Steve Bunce stuck to a single three-minute sitting. An emphasis on recovery forms part of the meticulous camp plotted by trainer Joe Gallagher, who has tried to frustrate his fighter in order to test his temperament in sparring, just as the craft of Lomachenko will on fight night. "Joe has had me almost purposely frustrated as on the night Lomachenko has made three or four world champions quit," said Crolla. "He breaks people up, discourages them and is so unique. You can't just get a fighter in to spar and copy him. You need three or four to do set-pieces that he does." Lomachenko boasts graceful feet, honed through his mastery of Ukrainian dance. But he is far from just a mover and his last win - over Puerto Rico's Jose Pedraza in December - showcased an 11th-round attack which ranks as one of the most relentless in recent history. "He is a matador. He very much plays the crowd for the 'ole' moments. But if you try to force the issue, he will light you up and you'll end up fighting quicker than you want to. "He is happy to be at range but anyone who gets in there and thinks 'let's have it', they bring out a different Lomachenko. The man is a serious body puncher. Not many people talk about it but he has taken people out that way. "I do see ways you can beat Lomachenko. It's about having the right horse for the right race. Anthony has had a lifetime of habits and that's what has been hard for this, getting him out of the habits - as certain shots he throws, you just can't against this guy." Crolla has been widely written off going into the 44th fight of a career sporting six defeats and three draws. Lomachenko has lost just once - in his second professional outing, when he shot for a world title against Mexico's Orlando Salido in 2014. It was a setback he recovered from, becoming a two-weight world champion by his seventh contest and a three-weight champion by his 12th. His record now contains noteworthy names, such as Jorge Linares - who has twice beaten Crolla - and two-time Olympic champion Guillermo Rigondeaux, who quit on his stool. The plaudits have flocked to champion a fighter some feel is the best in the world across the weight divisions and there have been rumblings from Lomachenko's camp that facing Crolla was a hindrance as he wanted to chase further belts and records. "We are not going to turn up, weigh in, take the money and go," added Gallagher. "It's not in my DNA and it's certainly not in Anthony's. "Some people think we are in La La land but we have trained to be the best we can be. If there is any chance Lomachenko has taken anything lightly, we will be prepared to take full advantage of that. "It's hard to find chinks in Lomachenko. But he has been beaten and has been knocked down. Things turn around and Anthony just needs that one moment. Lomachenko doesn't give you many but if he does, we have to take them with two hands. "If we pull this off, it's right up there. We are not praying on luck but we are going in with a game plan to create the biggest upset in the world."